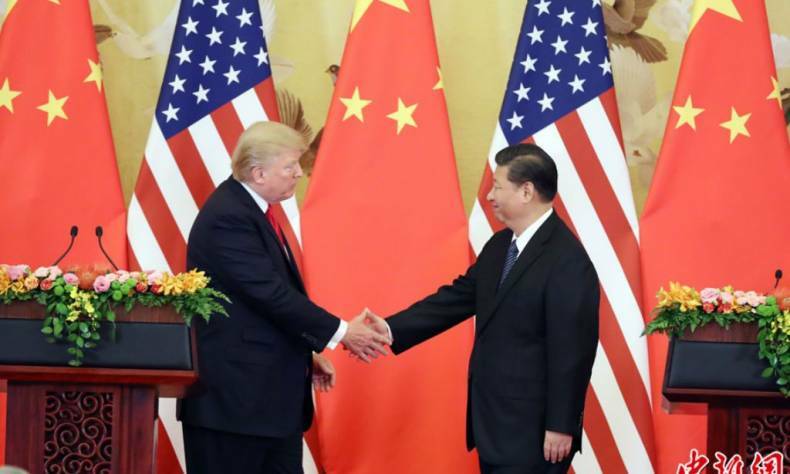 In the lead-up to U.S. President Donald Trump’s November visit to China, Chinese President Xi Jinping said in a phone call to Trump that China and the U.S. have a wide range of common interests, and that the two nations need to expand cooperation through exchanges at all levels to inject new vitality into Sino-U.S. relations. The policy choices of China and the U.S. have long been beyond the scope of bilateral relations which, to a large extent, determine the stability and prosperity of the Asia-Pacific region and of the world as a whole, and relate closely to the direction of global development. After almost four decades, China and the U.S. have formed a highly complex and interdependent relationship in all respects. During the first six months of the Trump administration, the U.S. president adopted a purely transactional approach to diplomatic relations with China, rendering the relationship listless and undefined. The debates on U.S. strategies towards China that emerged in 2015 had foreshadowed this state of affairs. Today, certain tough problems continue to test bilateral relations, notably the Korean nuclear issue, THAAD, contradictions between China and Japan in the East China Sea, and territorial disputes among China and certain ASEAN countries in the South China Sea. However, Sino-U.S. relations have progressed to a level that goes beyond susceptibility to either individual or unilateral cognitive changes. The rise of China and its growing influence, the phased success of China’s development model, as well as the U.S.’s own development and reliance on China’s participation in both global and regional major issues, have become structural factors in the stability of Sino-U.S. relations. Therefore, today’s Sino-U.S. relations generally remain on an even keel. Should strategic doubts or differences arise over certain major issues, their very existence can signal to the two countries the importance of objective dialogues that clarify one another’s intentions and bottom lines. Assessments of the costs and benefits of various policy options propel China and the U.S.’s continuing formulation of a new cognitive balance based on the existing regional pattern. This process has underlined that the best option is to carry on adjusting and adapting to one another amid different problematic areas through dialogue and consultation. On the basis of such consensus, the line of thought on Sino-U.S. relations is starting to undergo a fundamental change, namely, to confront the two nations’ disagreements over various problems and details rather than simply discuss the significance and irreversibility of bilateral ties at the strategic level. It is precisely this optimistic presupposition that could avoid many of the negative effects of past Sino-U.S. exchanges. After their meeting at the Mar-a-Lago resort in Florida, the two leaders engaged in various levels of communication on a wide range of international occasions. These instances reflect the two sides’ conscious shaping of Sino-U.S. relations and their strengthening of effective communication towards creating favorable conditions for Sino-U.S. relations. Since Trump took office, one new feature of Sino-U.S. exchanges in addition to bolstered dialogue on a functional level, is that of more frequent dialogues and conversations at the leadership level. Only last September, President Xi Jinping had two phone conversations with President Trump at Trump’s request to discuss regional matters, for example, the Korean nuclear issue, and Trump’s upcoming visit to China. Chinese Vice Premier Wang Yang addresses the first U.S.-China Comprehensive Economic Dialogue in Washington, D.C. on July 19, 2017. The dialogue between the Chinese and American leaders has clearly played two roles. One is stabilization. Although President Trump is prone to expressing dissenting opinions on Twitter, frequent phone calls between the two leaders clearly keep China-U.S. relations on a stable track. The other role is that of a propeller. The reason for these recurrent calls is the need to acknowledge consensus and the existence of cooperation space. Leaders’ direct calls undoubtedly increase mutual trust. They also reduce the potential for information errors that could occur in communications at the functional, purely work-related level, which telephone exchanges between the two leaders also test and oversee. These one-to-one calls thus help China and the U.S. develop more mature partnerships. The four high-level dialogue mechanisms built during President Xi’s visit to the U.S. fully embody this idea. Different from the previous Sino-U.S. strategic and economic dialogue that would lead all issues, the four high-level dialogue mechanisms – which cover diplomatic and security issues, the economy, social and cultural issues, and law enforcement and cyber security – define the type of dialogues, strengthen the pertinence of specific issues, enhance control of the topics for discussion, and enable the two sides’ deeper understanding of one another’s positions and differences. They hence facilitate discussion of ideas, and ways to solve the problem in question. The diplomatic and security dialogue so far carried out takes the same form as that between the U.S. and its allies, so buttressing the foundation of trust between China and the U.S. The development of Sino-U.S. relations has thus formulated a “problem-oriented” and “result-oriented” line of thought. The two sides have reaffirmed in this dialogue the importance of establishing mutual understanding and minimizing the risk of a miscalculation by either of their respective armed forces. They also reaffirmed their MOUs on the implementation of confidence-building measures, including the mutual notification mechanism for major military operations and the code of conduct for unplanned sea and air encounters. These mechanisms and guidelines serve as a risk control instruction manual for potential conflicts. One direct result is that both China and the U.S. now adopt more cautious attitudes in their daily interactions, and an approach marked by mutual recognition of differences and the potential risk they carry. Chinese Vice Premier Liu Yandong (right center), accompanied by U.S. Transportation Secretary Elaine Chao (left center) and Education Secretary Betsy DeVos (fifth right), attend a dialogue between youth delegates of the first U.S.-China Social and Cultural Dialogue in Washington, D.C. on September 28, 2017. At the economic and trade level, the reason why China and the U.S. have established a “comprehensive” economic dialogue is in expectations of a broader scope of dialogue with more specific content. But the process will inevitably highlight divergences. Moreover, high Sino-U.S. trade interdependence and vulnerability makes it impossible for one party to compel the other party to accede without question to a particular program. The only solution is to seek a new consensus and form a dispute settlement mechanism. This is why the two sides initiated in May the 100-day economic cooperation action plan, laying foundations for the opening of comprehensive economic dialogue. The action plan has so far achieved important mutually beneficial results. They include the return of U.S. beef to the Chinese market after 14 years, the gradual dismantling of a policy barrier to exporting U.S. liquefied natural gas to China, China’s approval of five U.S. biotechnology products, China’s export of cooked poultry to the U.S., and the gradual implementation of financial applications. These results create both a good foundation of trust and a suitable climate of cooperation for economic dialogue. At the first round of U.S.-China Comprehensive Economic Dialogue (CED) held in Washington, D.C. in July, the two sides discussed the expansion of trade in services and increased mutual investment, and carried out constructive cooperation towards narrowing the trade deficit. They also reached a consensus on the protection of intellectual property rights, on easing export controls, strengthening agricultural trade, and other specific issues. “We choose cooperation not out of consideration for the other party’s interests, but rather for our own interests. This constitutes the internal motivation for continued dialogues between the two sides,” said Chinese Vice Premier Wang Yang at the CED. U.S. Secretary of Commerce Wilbur Ross said in his concluding remarks that, through a constructive dialogue, the two sides enhance mutual respect and promote mutual understanding, thus to lay a solid foundation for future cooperation. On the other hand, if there are no serious differences, or if problems arise that cannot be countenanced, the basis of Sino-U.S. cooperation will vanish. Determining Sino-U.S. relations based solely on the outcome of one or two conversations, or the extent of differences, amounts to strategic nearsightedness and unrealistic expectations. China and the U.S. have recently held the dialogue on law enforcement and cyber security, and also the social and cultural dialogue. There is broad space for cooperation in these areas, which makes possible the exploration of new growth points. Network security is a growingly common concern of the two countries. The current cyber world still lacks clear rules and definitions of the problems at hand. The pernicious effects of this absence of control varies in different countries. China and the U.S. need to strengthen their cooperation with the world’s major powers in order to clarify key concepts, develop common rules, and prevent cyber security from becoming a factor that negatively affects Sino-U.S. relations. This will provide global public goods in the form of orderly operation of cyberspace. Social and cultural exchanges have always been an important link between China and the United States. Mutual understanding and recognition is their cooperative foundation on any given issue. In light of significant changes in both societies, the two sides need to expand mutual understanding of one another’s culture, history, and way of thinking. Only then will China and the U.S. be able to understand each other when tackling major diplomatic and political issues, and formulate concrete coordinative policies. In this regard, Sino-U.S. social and cultural exchanges will continue to play an indispensable role. On the basis of these dialogues, Sino-U.S. cooperation needs to achieve two higher goals. First, as world’s two major countries, both should solve bilateral problems through their native practices, and consider the arrangement of a new order. The four high-level dialogue mechanisms relate to the stabilization of the order in certain areas, or to their remodeling. This is of great significance in solving regional and global problems. Sino-U.S. cooperation will determine whether the East Asian regional order that is affected by various security issues can be stabilized, whether the free trade order that benefits all countries is sustainable, and whether the “wild” cyber world can operate in an orderly manner. Second, China and the U.S. must achieve a high level of mutual understanding, that is to say, mutual understanding and ideological respect. The reason why there is so much talk these days about the Thucydides Trap and the “tragedy of great power politics” is that the West has predicted China’s path of choice according to its own historical precedents. This kind of presupposition signifies the West’s disregard for the differences between Chinese and Western culture. Certain reactive policies, in the context of China’s rise, simply assume that China will follow in the footsteps of big powers that, upon gaining strength, sought hegemony. China and the U.S. need to achieve a new model of relations between major powers, and must cross this gap ultimately to achieve a sense of mutual recognition. This is the significance of Sino-U.S. dialogue, and also the historical mission of the two countries. After decades of development, Sino-U.S. relations still face new problems, and experience constant run-ins that change mutual perceptions of one another. And as their respective social structures, along with the international environment, continue to change, Sino-U.S. relations can best be portrayed as “crossing the river by feeling the stones” – testing each step and advancing cautiously. There is good reason to believe that China and the United States can create a better future, and President Trump’s visit to China will enable him to strengthen awareness of this trend.